I got to the Golf Tournament early in the morning (before 8am) and was able to catch the early birds on the course before the crowds got there. The first three I got were the trio of quarterbacks, Steve Bartkowski, Billy Joe Tolliver and Browning Nagle. Bartkowski and the others were extremely nice and even let me ride around in a golf cart for a hole or two with them. They were more than happy to sign any cards I had, and Steve signed these two cards for me after I gave him and the others the drawings I did for them. 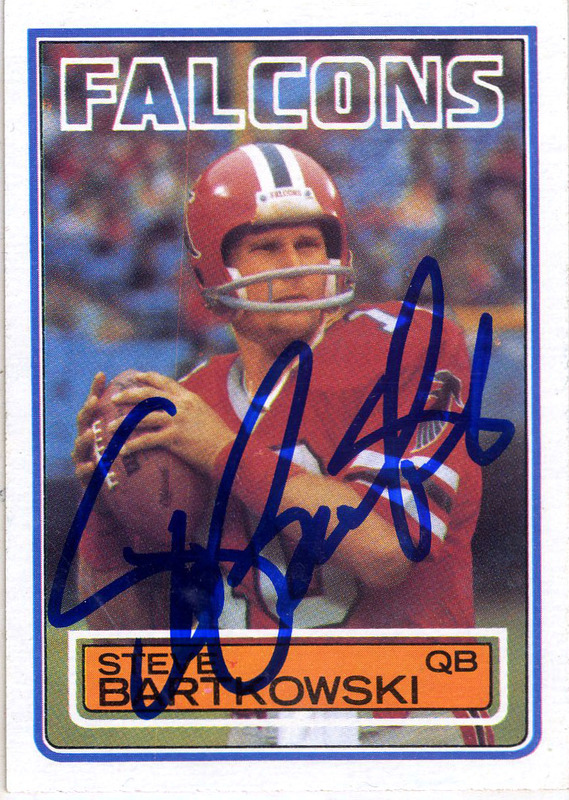 Steve was the #1 pick of the NFL draft of 1975 for the Atlanta Falcons, and garnered NFL Rookie of the Year Honors that year. Bartkowski lead the Falcons from 1975 to 1985 (and Rams in 1986). 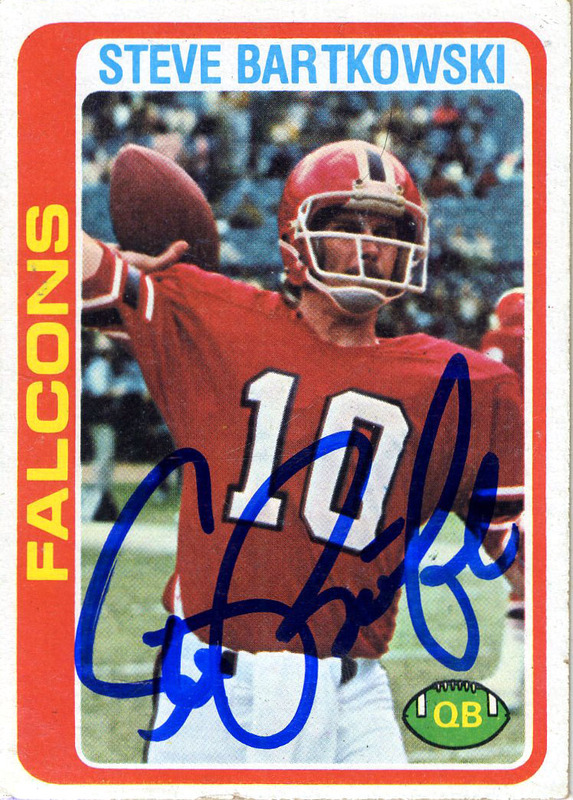 He still owns many of the Falcons passing records to this day. Bartkowski’s career got off to an extremely rough start but blossomed as his career continued under center leading the team to division championships in 1980 and 1982. (You see in those days #1 choices and quarterbacks were given 5 or 6 years to blossom.) 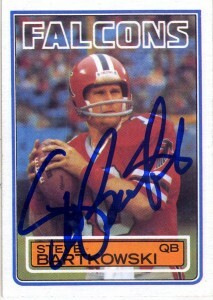 Steve was a two time Pro Bowler and threw 22 touchdowns to 5 picks in 1983. (He is also notable for being Leigh Steinberg’s first client and for being taken ahead of HoF runningback Walter Payton.) After retirement Steve has continued to live and work in the Atlanta area, working for contractual commercial building firms, in sports broadcasting and television as a color analyst, sits on the board of directors for the Atlanta Falcons and is an avid golfer with a scratch handicap.